M T D O c t o b e r 2 0 1 8 14 N e w s / V i e w s TIA welcomes 5 new board members 3 ARE TIRE DEALERS, 2 ARE SUPPLIERS T ire Industr y Association (TIA) members have elected four new members to the board of directors. And a fih member has been appointed to fill a vacancy on the board. e board members will take office Oct. 29 at TIA's Board of Directors meet- ing held at Bally's Hotel in Las Vegas in advance of the 2018 Specialty Equipment Market Association (SEMA) Show and Global Tire Expo. ese four members each will serve a three-year term. John Baldwin, Discount Tire Co.: Baldwin is the chief product and technical strategist for Discount Tire. He's been rec- ognized internationally for his research on tire aging, tire test development, and tire service life prediction, and he was an integral part of the root cause team while working for Ford Motor Co. during the Firestone tire/Explorer recall. In his current role with Discount Tire he has traveled the world to work with tire manufacturers on improv- ing tire construction and performance. Russell Devens, McCarthy Tire Service Co. Inc.: Devens is the director of safety and risk management for McCarthy Tire Service. He has more than 30 years of experience in safety, law enforcement, security, insurance and risk management. He is a Level 400 Commercial Tire Service TIA Instructor, a Part 48 Certified and Part 46 Instructor with Mine Safety & Health Administration (MSHA), 30-hour General Industry Certified with OSHA, a Certified Commercial Vehicle Inspector with US DOT, and holds a bachelor's degree in criminal justice from King's College. He conducts training, evaluations of workplace safety, emergency response, hazardous materials management, and facility security for more than 50 locations in nine states. Stephen Lyons, Monro Inc.: Lyons is the director of training for Monro. His department supports a tech hotline that's available for all employees when they encounter an issue with vehicles or are looking for direction on a specific process or application. is year Monro also is launching Monro Online University, a training platform focusing on teammate development and career path progression. Before he joined Monro, Lyons spent 14 years working for Bridgestone Americas Inc. He served as a retail sales teammate, store manager, district manager and was the National Division Education Manager that supported more than 2,200 retail stores and 22,000 teammates. He also work on the launch and deployments of new products at Bridgestone, including the company's Olympic partnership and the Maplewood High School Project that incorporated Bridgestone's team training into the high school's automotive program curriculum. Don Vanderheyden, Hennessy Indus- tries Inc.: Vanderheyden is vice president of marketing for Hennessy. Since joining the company in 2001, he's worked in purchasing, marketing, and sales, and in August 2010 he was promoted from director of pro- gram distribution to regional vice presi- dent of sales and has led the marketing team since June 2015. Prior to joining Hennessy, Vanderheyden worked at Stihl Inc. In addition, a fifth member was appointed to the board. Keith Jarman, president of AME International, replaces Dan Nothdur, owner of Tires Tires Tires in Sioux Falls, S.D., who has moved up and will serve as secretary of the board. Jarman will serve a one-year term on the board. Jarman has served on the TIA board since 2009. He started AME International in 2007 aer working in the industry for more than 14 years. 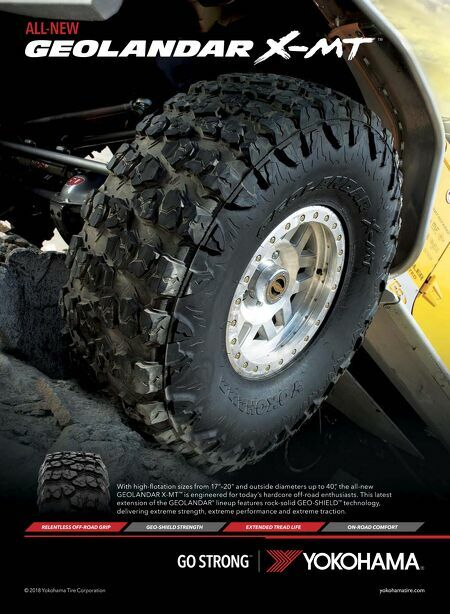 His company regularly participates and supports TIA off-the-road tire training out in the field, and Jarman is the recognized authority on tire bead breaking tools and equipment for changing construction and earthmover tires. ■ Vanderheyden joined Hen- nessy in 2001. Oct. 9-12 Tire Industry Association (TIA) Automotive Tire Service (ATS) Advanced Instructor Train- ing Tour, Baltimore, Md. (800) 876-8372 www.tireindustry.org Oct. 27-31 American Trucking Associations Manage- ment Conference & Exhibition, Austin Convention Center, Austin, Texas (703) 838-1700 www.trucking.org Oct. 30-Nov. 2 Automotive Aftermarket Industry Week (AAIW) including the Specialty Equipment Market Association (SEMA) Show, the Tire Industry Association's (TIA) Global Tire Expo, and the Automotive Aftermarket Products Expo (AAPEX), Las Vegas, Nev. (800) 876-8372 www.tireindustry.org Nov. 7-10 Automechanika Buenos Aires, La Rural Trade Center, Buenos Aires, Argentina www.automechanika.ar.messefrankfurt.com Nov. 29-Dec. 2 Automechanika Shanghai, National Exhibi- tion and Convention Center, Puxi, Shanghai, Hong Kong www.automechanika-shanghai. 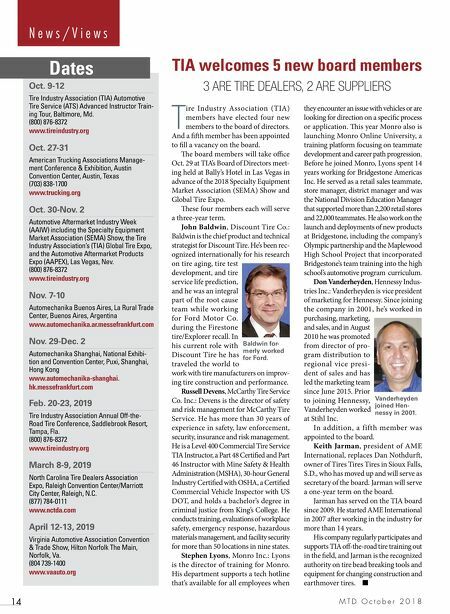 hk.messefrankfurt.com Feb. 20-23, 2019 Tire Industry Association Annual Off-the- Road Tire Conference, Saddlebrook Resort, Tampa, Fla. (800) 876-8372 www.tireindustry.org March 8-9, 2019 North Carolina Tire Dealers Association Expo, Raleigh Convention Center/Marriott City Center, Raleigh, N.C. (877) 784-0111 www.nctda.com April 12-13, 2019 Virginia Automotive Association Convention & Trade Show, Hilton Norfolk The Main, Norfolk, Va. (804 739-1400 www.vaauto.org Dates Baldwin for- merly worked for Ford.